Oliver Grady, Jr., age six and three-quarters, wears the same pair of pants every day. They are not his favorite pants nor his only pants, they are simply, as he puts it, the pants. Being a boy growing at the rate boys do, these trousers he has worn for nearly a whole year do not fit as well as they once did. His mother is faced with the onerous task of either washing them daily or sending him to school in filthy britches; the fight if she suggests he wear anything else is disastrous. 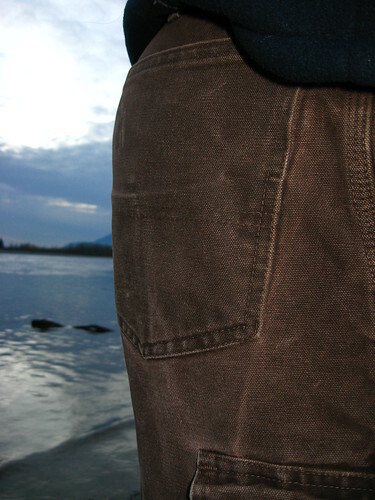 There is nothing to like about the too-small pants—off-color, falling apart, uncomfortable—except the back left pocket. That pocket is endless, and Oliver has filled it with interesting rocks, frogs, bits of string, toys, a ruler, hats, bugs, bouncy balls, firecrackers, comic books, crayons, scraps of paper, candy bars, two bent forks and one tarnished spoon, six pen-knives, an assortment of sticks, headphones, plastic bandages, two of his sister’s dolls and one kitten, among others. These things never get lost in the wash. They can easily be retrieved. Oliver can never give up the pants, or he’d lose the pocket. Short and sweet – I like it!